iPhone is known as the fastest smartphone, which is developed by Apple and this product is hugely popular around the world for its excellent features. With the advancement of technology, iPhone brings new versions with more exceptional configurations. iPhone 6S and 6S Plus were introduced in 2015, which comes up with strengthened chassis, upgraded system-on-chip, and the best quality camera. This version is highly praised by the users and gained its popularity rapidly. Despite having exclusive features, iPhone still cannot ditch some common glitches due to some technical faults. iPhone 6S/6S Plus touchscreen unresponsive is one such problem, which can put you into trouble. You may face this problem when you try to unlock your device. There are some hardware and software issues, which can lead to this issue. If you are also facing the same problem with the iPhone touch screen not working properly, then this article will guide you to resolve it quickly. We will provide you with all the reasons behind this problem and the methods to troubleshoot it. An unresponsive iPhone touchscreen is an annoying problem, which can occur due to several software and hardware issues. Before you try some easy fixing tricks, you must know the basic reasons behind this problem, that will help you to troubleshoot it on your own. Sometimes, if any dirt or dust particles enter into the touchscreen, that can cause iPhone 6S/6S Plus touchscreen unresponsive. These can be transferred from your finger or from other sources. When these dirt particles get in touch with the Circuit board, that can lead to the touchscreen not working. Due to dropping the phone from a height, if any hardware components get cracked or damaged, that can make the touchscreen unresponsive. Also, the entry of water inside the iPhone can be another reason. Maybe, you have any corrupted file in the system registry which is equally responsible for the issue. Also, if you don’t have an updated version of iOS, it can also cause this problem. You must have an updated iOS, which is compatible with the iPhone 6S or 6S Plus. If your iPhone is running out of memory, that can be a reason behind the touchscreen becoming unresponsive. Some third-party faulty application can create a lot of iPhone problems along with this issue. After figuring out the root-cause of iPhone screen unresponsive to touch, you can try some basic solutions to resolve it. Touchscreen problems can occur from dirt and dust on the screen. First of all, you should clean the mobile screen as well as your fingers. Also, you can use a thick screen protector, which will give your iPhone screen a good look and will also reveal any oil, liquid, moisture or anything else, which may create touchscreen problems. You can wash the screen protector with soft cotton clothes. Also, keep your fingers clean while using your iPhone to take precaution for avoiding iPhone 6S/6S Plus touchscreen unresponsive. As the problem can possibly lie in the software, you can try to fix it by rebooting, which is also known as soft reset. Basically, you just need to turn off your iPhone for a few seconds and turn it on after some time, which gives a fresh start to your device. By doing it, you can eliminate any corrupt file from the system registry as well as clear some space in the iPhone memory. To perform this, press the Power button and hold it for 10 seconds. Then, a slider will appear; drag the slider to Power off the iPhone. Now, you can repeat the same process to turn on the iPhone device. 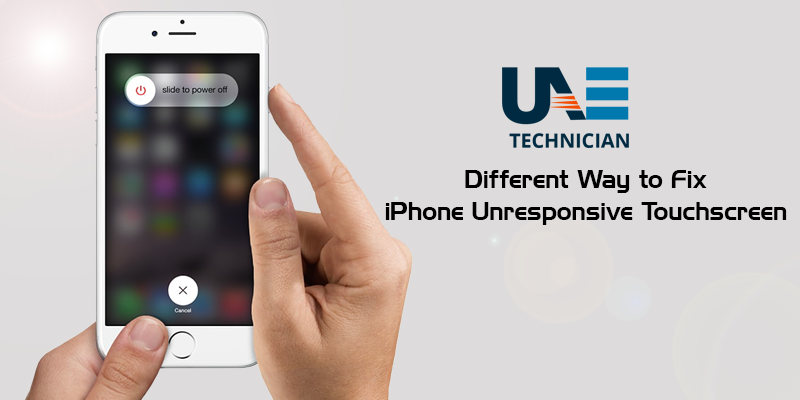 If the above-mentioned process doesn’t work for you, then you can try a force reset to fix iPhone 6S/6S Plus touchscreen unresponsive. To do this, press the Sleep button and Home button together and then hold it for 20 seconds. Now, release both the buttons after the Apple logo appears and wait for the rebooting process to complete. Both the hard and soft reset methods are considered easy and safe to resolve iPhone 6S touch screen not working cant unlock. By adjusting the 3D touch settings, you can rectify iPhone 6S/6S Plus touchscreen unresponsive issue quite easily. This can be an effective solution to your problem. Go to the Settings first and click on General. Now, select Accessibility and tap on the 3D Touch option and adjust the Sensitivity Settings from there. After doing that, just reboot your iPhone and check whether the problem is still present or not. Is your iPhone 6S touchscreen not working after replacement? It can occur due to the low internal storage of your iPhone. This issue can create a lot of problems like delayed touchscreen problem, random freezes, or unresponsive display. To fix this, you can remove unwanted contents like unnecessary messages, and unused apps from your device. Also, you can move your files to other devices for clearing up memory storage. To check the memory status, you can go to the Settings, then select the General tab. After doing this, you can tap on the Storage & iCloud usage and then click on the Manage Storage. There, you can see the amount of memory storage that is present for your iPhone. At first, press the Power and Volume buttons simultaneously and hold both buttons until the screen turns black. After doing this, your iPhone will and you will see the Apple logo on the screen. Now, go to Settings; if you don’t find any tweaks under this, then you are now in the safe mode. Also, all the third-party faulty apps are disabled in the safe mode. When you come across iPhone 6S/6S Plus touchscreen unresponsive, then you can try a factory reset of your iPhone. But keep in mind that, this process will delete all the data in your iPhone device. So, you can backup all your important files before performing this process. First, go to the Settings and tap on the General tab. Now, you will find the Reset option; click on that. After doing this, click on the Erase All Content and Settings option. In case your phone’s touchscreen is cracked or damaged, that can trigger the touchscreen to become unresponsive, Also, seepage of water inside the iPhone’s circuit board can also result in this issue. So, try to be conscious while using your phone. Try the steps explained in this blog to resolve iPhone 6S/6S Plus touchscreen unresponsive. If you are unable to fix the issue, you can go for an iPhone repair or iPhone screen repair from an affordable service center.